Shop online for over 300 american-models model trains at discounts up to 34%. Buildings is the most popular of the 9 american-models model trains categories, then Freight Cars, and Passenger Cars. This is just the HO Scale Generator Crates pkg(2) - Kit (Laser-cut Wood) - For Walthers Life-Like SceneMaster(TM) Kit from American Model Builders. 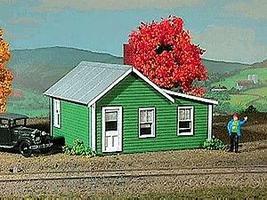 This is the HO Scale Company House - LASERkit(R) Xpress - Kit - 2-3/4 x 2-1/2 x 2'' 6.8 x 6.2 x 5cm from American Model Builders. This is the HO Scale Wood Deck for ExactRail 53'-6" GSC Flat Car with 43'-3" Truck Centers from American Model Builders. 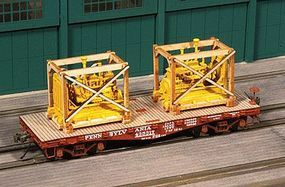 This is the HO Scale Wooden Crates w/Blocking Flat Car Load Kit from American Model Builders. This is the HO Scale Wood Deck for ExactRail 42' GSC Flat Car from American Model Builders. 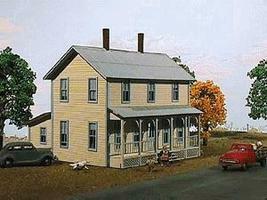 This is the N Scale Two-Story Farmhouse w/Porch - LASERkit(R) - Kit - 2-1/2 x 1-3/4 x 2-1/4'' from American Model Builders. 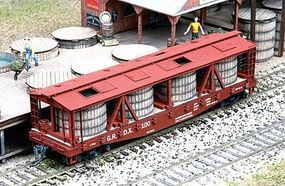 This is the HO Scale Flat Car Lumber Load Kit from American Model Builders. This is the HO Scale Pickle Car Conversion Kit - For Athearn or Tichy 40' Flatcar from American Model Builders. This is the HO Scale Crossroads Church - LASERkit(R) Xpress - Kit - 4 x 2 x 3-1/2'' 10 x 5 x 8.7cm from American Model Builders. This is the HO Scale Class CF Caboose - Kit (Laser-Cut Wood) - Norfolk & Western from American Model Builders. This is the N Scale Northern Pacific 1200 Series Wood Cupola Caboose Kit from American Model Builders. This is the N Scale Pickle Car Conversion - Kit - Fits Red Caboose Flatcar Kit from American Model Builders. This is the N Scale Country Barn Kit from American Model Builders. This is the HO Scale Wood Caboose - Kit (Laser-cut Wood) - Nickel Plate Road from American Model Builders. This is the N Scale Midwest Farm Combo - LASERkit(R) - Kit from American Model Builders. This is the N Scale Great Northern 25' Wood Cupola Caboose - Kit - 1950s Modernized Version (Undecorated) Kit from American Model Builders. This is the N Scale Crankshaft & Cradle Flatcar Load Kit from American Model Builders. This is the N Scale Crossroads Church - 2-1/2 x 1-1/8 x 2'' from American Model Builders. This is the HO Scale 1-Car Garage Building Kit from American Model Builders. This is the HO Scale Midwest Farm Combo - LASERkit(R) Kit from American Model Builders.